By the time Charlie Chaplin began work on what would be his first feature-length film, in 1919, he had been sneaking up to the longer format for some time. The bulk of the films that made him famous up to that point had been of the two-reel length (roughly twenty minutes), which was the accepted format for slapstick comedians. But Chaplin had ambitions for his beloved Tramp character. He wanted to add depth and resonance to his comedies and for that he needed more time. For this, he would work with a costar—a character whose importance to the story would be fully equal to his own—something he had not chosen to do since his days in Mack Sennett’s Keystone Studios ensemble. But he wouldn’t be working with a Mabel Normand or a Fatty Arbuckle. 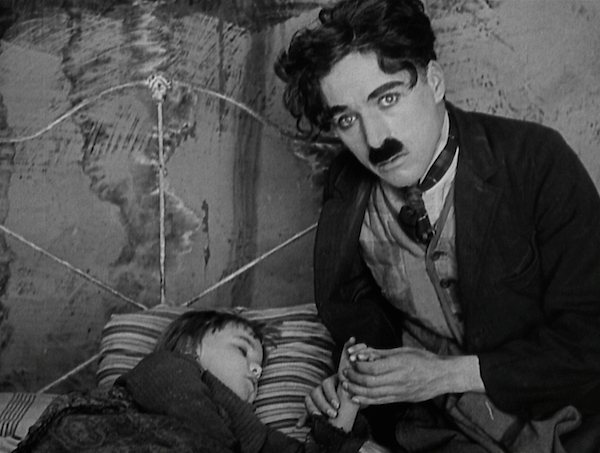 Now, for the first time, he would work with a kid—or, to be more precise, The Kid (1921). By the time Chaplin’s film premiered, child characters, comic and dramatic, had become a staple of popular culture. In literature, Twain’s Tom Sawyer and Huckleberry Finn had been joined by the likes of newspaper humorist George W. Peck’s mischievous “Peck’s Bad Boy” and Penrod, the title character of a set of novels by author Booth Tarkington, the first installment of which was published a few years before The Kid’s release. The American comic strip had originated in the 1890s with Richard F. Outcault’s Hogan’s Alley, at its center a child character, the Yellow Kid, whose home turf looked not unlike the slum that would house Chaplin’s Tramp and his Kid. As comic strips caught on, the Yellow Kid was joined by a gallery of comic children, from the naughty Buster Brown to the sociopathic Katzenjammer Kids. In this era of lax child labor laws, children were used and exploited, often by their parents, in vaudeville acts that toured the country endlessly. In one such act, around the turn of the century, a very young Buster Keaton learned to take spectacular falls as he was hurled about the stage by his father, Joe. And Chaplin himself began his career as a child performer in English music halls. There were also child actors working in the movies before The Kid, but none really achieved major star status. If you’d asked audiences who was their favorite cinema kid, they might have said Mary Pickford, who was still playing children in popular films such as The Poor Little Rich Girl and The Little Princess (both 1917)—films she made when she was in her twenties. 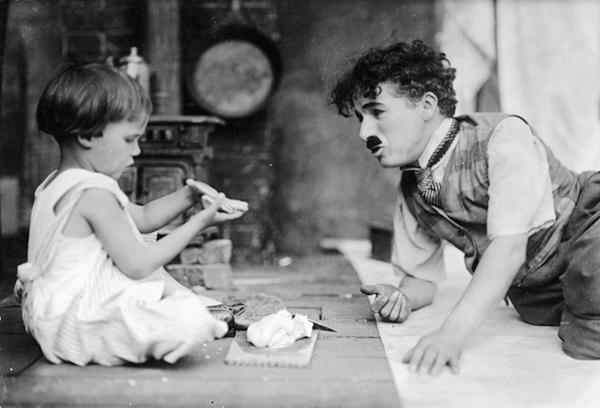 All this changed after Chaplin cast his costar, Jackie Coogan, the five-year-old version of the film’s baby, abandoned by his unwed mother (played by Edna Purviance, a frequent Chaplin collaborator) and found in an alley by the Tramp. But the Kid’s greatest import for Chaplin was to give him the means to create an emotional arc strong enough to sustain a feature. In his earlier films, Chaplin had given heart to his character via romantic love. His striving for—and, more often than not, losing of—his love interest created what we think of as Chaplinesque pathos. Yet the easy affection the pair display in their sharing of a breakfast conveys (and this is no small creative feat) that they are a loving family that has grown through five years of meals together. And, petty crimes notwithstanding, we want them to stay together. Over the course of an hour, the Tramp grows from an unwilling father to one who cares so much that the scenes in which he is separated from and then reunited with the Kid achieve an emotional impact greater than any he had ever previously put on film and which he would match only one more time, with the closing scene of City Lights a decade later. 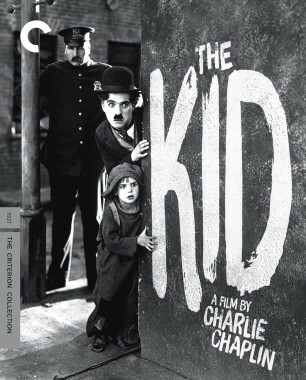 Upon its release in 1921, The Kid was a great success. Audiences loved little Jackie just asthey loved the Tramp, and the film launched Coogan into a career in which he would now be the lead character. Can we say that Chaplin invented the child star? It’s probably fair to say that this was going to happen at some point with or without him. Several of young Coogan’s subsequent features were adaptations of eminently filmable classics—the aforementioned Peck’s Bad Boy (1921), as well as Oliver Twist (1922) and Tom Sawyer (1930)—suggesting that the movies were waiting for a Jackie Coogan to arise. Still, there’s no question that a lot of kids crashed through the door Chaplin opened. The twenties also saw the arrival of a young child star known as Baby Peggy (who later became a writer and film historian, then known by the name Diana Serra Cary, whose books included a biography of her friend Jackie Coogan), along with the kids of Hal Roach’s Our Gang and their imitators, and Mickey Rooney, who made his starring debut in short silent comedies as Mickey McGuire, a character from Fontaine Fox’s popular comic strip Toonerville Folks. And the advent of the sound era sparked an explosion in child actors and stars that has never diminished. But The Kid has had another, even more direct influence on film history. The film’s basic plot, that of a comic character who grows emotionally by being bonded to an unexpected child, has become one of the most enduring—some might say purloined—stories in American film. Not surprisingly, Coogan was among the first to reusethe idea in several of his films—notably 1925’s The Rag Man, in which orphan Jackie is taken under the wing of a junk man played by Hal Roach comedy star Max Davidson. This film was popular enough to spawn a sequel, Old Clothes, released later that year, which also added a rising, twenty-year-old Joan Crawford to the mix. By 1931, at the dawn of the sound era, Our Gang veteran Jackie Cooper had slipped past an aging Jackie Coogan to be film’s top child star. In that year’s hugely popular filmThe Champ, Cooper was teamed with a blustery Wallace Beery, who played his alcoholic prizefighter father. Although the film is more melodrama than comedy, its basic thread of a child softening his father charmed audiences—and Cooper and Beery went on to team up for several more hit movies. 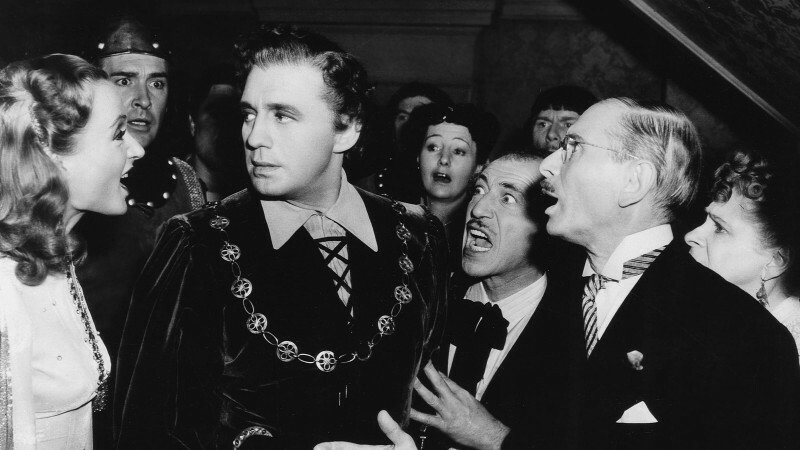 The century’s two wars inspired more Kid-like story lines, putting orphans at the doors of classic comedy teams. In Pack Up Your Troubles (1932), Laurel and Hardy were charged with looking after the daughter of a friend killed in WWI’s trenches. 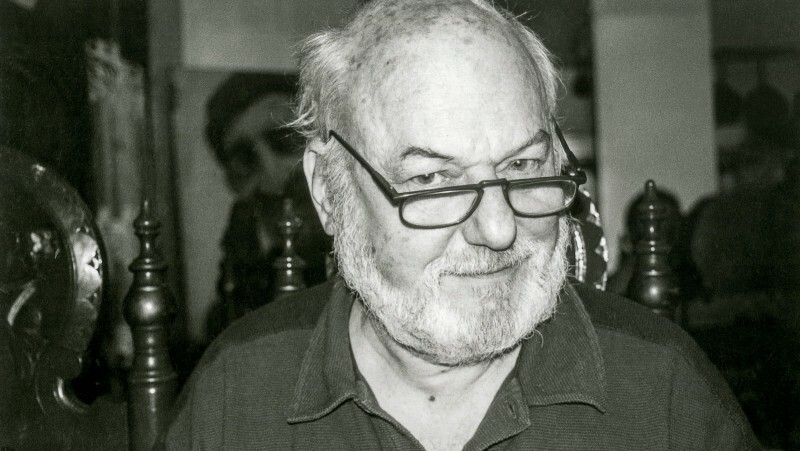 (Stan’s character was so childlike himself that while reading a bedtime story to the girl, Jackie Lyn Dutton—my, there were lot of Jackies—he puts himself to sleep instead.) 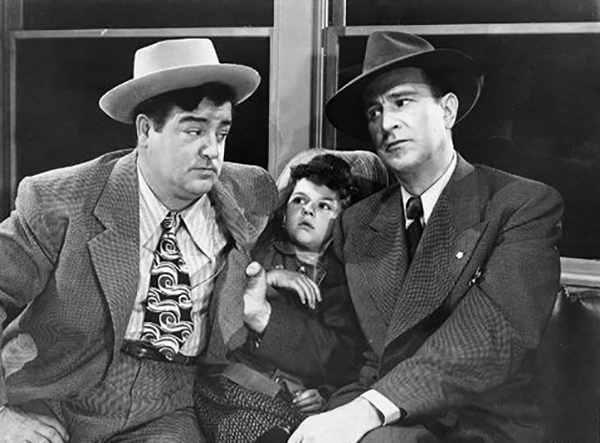 After WWII, Abbott and Costello, who had become top box-office attractions with their smash hit Buck Privates in 1941, made the underrated postwar sequel Buck Privates Come Home (1947), which found them caring for a French war orphan (Beverly Simmons) and brought out Lou Costello’s real gift for Chaplinesque pathos. Many more pairings followed in the years to come, from Red Skelton and Tim Considine in The Clown (1953), a version of The Champ whose boxer has been made into a more Skeltonesque lead character, to Jackie Gleason and Diane Gardner in Gigot (1962). 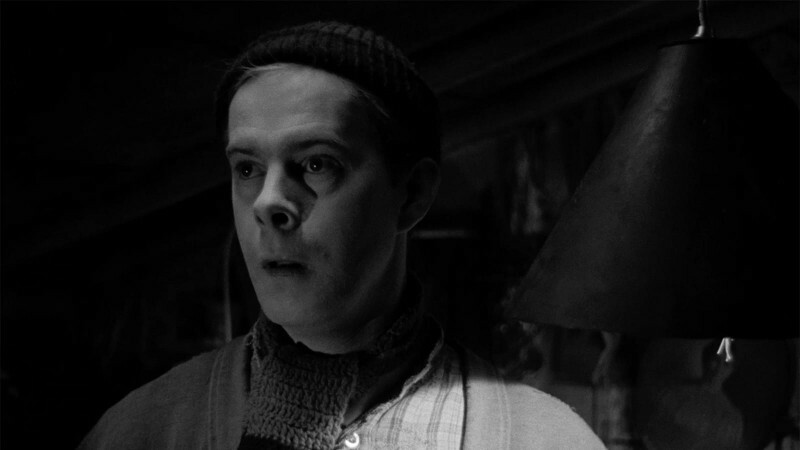 That film took full aim at Chaplin, dosing its story of a down-and-out mute (!) 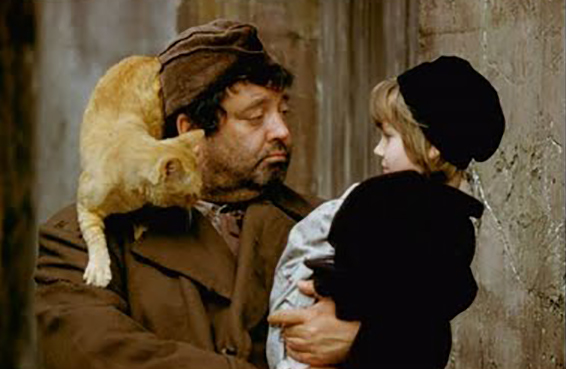 made to care for a little girl in Paris with more heavy-handed pathos than many audiences (and critics) could take. Zipping forward a few years (please keep arms and legs inside the vehicle at all times), we come to writer-director-producer John Hughes, who spent much of the nineties making films with child protagonists. In between Home Alone (1990) and Home Alone 2 (1992), he teamed a little boy with Ed O’Neill in Dutch and a little girl with James Belushi in Curly Sue (both 1991). A decade later, there was 2002’s About a Boy—adapted from Nick Hornby’s novel about a man who befriends a young boy in a ploy to meet women—which is a smart film that feels contemporary while honoring the Chaplin template. When Hugh Grant’s character replies to a rebuke of “I just thought you had hidden depths!” with “Oh no, no, no . . . I really am this shallow!” he could be speaking for the pre-Jackie Tramp and all the clowns who followed him. And so it goes, right up to TV’s long-running series Two and a Half Men. It’s likely that many of those who appropriate this story line never think of Chaplin. As a narrative trope is handed down from artist to artist over the years, its origin can get lost or muddled, as in a game of telephone. But the next time you spot this story, and you will see it again and again, look very closely—you might see the shimmering ghosts of the boy with the floppy cap and his unlikely foster father.